If you want to find one of the best fish finders that you will use, then you would be wise to consider buying a best Lowrance fish finder. These particular fish finders are some of the better options on the market, and they’re going to be a great choice for anybody who wants to purchase a fish finder. On this particular post, you are going to find plenty of Lowrance fish finder reviews to help make sure that you get the best one. By following the product recommendations outlined below, you’ll have no problem seeing just how great the Lowrance fish finders are. If you want to find one of the better fish finders on the market without breaking the bank, then this one might be the perfect option for you. Priced at one of the lower tiers compared to all of the products reviewed in this post, this particular product is going to deliver a ton of great features you’ll love to use. The LED, backlit color display screen comes with a detailed resolution of 320 x 240 so that you can easily see exactly what is happening on the screen, even when it is in full sunlight, or you are viewing it at a wide angle. The broadband sounder details help you to easily identify fish targets, bottom contour, structure detail, thermocline and more. You will spend less time manually adjusting the settings because the advanced signal processing will do a lot of that for you automatically. Also, the dual-frequency operation at both 83 KHz and 200 KHZ makes it simple for you to maximize the view of what is going on below your boat. With the 83 kHz, you can see up to 60 degrees of coverage, which is great for large fish or searching large areas. This is going to be one of the mid-range options when it comes to the price of the products reviewed on this list, but it does have a ton of great features that help to justify the price you are paying. The screen on this particular fish finder is great because it is a five-inch color LCD screen, which makes it easy for you to see everything that is going on under the water. In addition to the large screen, you’ll find easy to access and use buttons located on the right side of the screen for convenience. and the Structure Scan fish finder makes it simple for you to locate the fish under the water. Since you simply need to use the included transom mount transducer, you will have no problem seeing all of the fish under the water in great detail, so you know exactly where they are and what you’re going for when you cast your line into the water. As we continue on the list of products to review, you’ll find that the price continues to increase, but with that, the features offered by each fish finder get better and better so you’re sure to benefit from the increased cost that you might be paying to buy it. The Lowrance Elite-7 Ti has a high-resolution, seven-inch LED color display so that you can see everything these is to see. The touchscreen feature is also great because it allows for fast access to the options you want without having to fidget around with the button on the side of the unit as some other options. This fish finder ﻿﻿﻿combined ﻿﻿﻿GPS, CHIRP sonar, Structure Scan and DownScan imaging to help make sure that you get the top-of-the-line technology at your fingertips and you get the best view of what is happening below you. The TrackBack feature can be helpful as it allows you to scroll back through all the data and mark different locations with a waypoint. Also, the internal GPS antenna is highly accurate and even includes a detailed U.S. map. Lastly, you’ll get access to the GoFree Cloud which allows you to shop, purchase and download the different upgrade for your device including maps and other data. When it comes down to finding one of the best overall performing fish finders on the market, there are only a handful of them that are better than this particular unit. 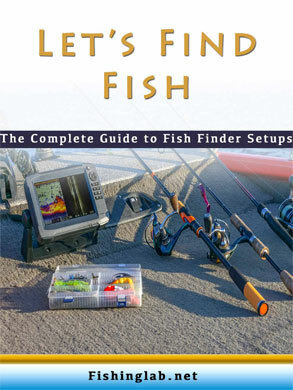 It comes with everything that you could need when it comes to a fish finder, and it is so easy to use as well! You’re going to get an award-winning broadband sounder that can overlay different maps and even use the trackback feature so you can easily see where you have been already on the water. The screen on this fish finder is also second to none because it is super-bright and widescreen and can display in 7, 9 or 12-inch sizes, all of which have touch screen control for even simpler use. The interface on this unit comes with redesigned menus and five different push-button controls so that your operation of the unit is simple, but you are not losing any of the features that made this product great in the first place. Lastly, four channel sonar technology helps to give you signals for left, right and down-looking images and you can easily overlay downs onto the sounder view so that you get the best fish and structure finding a display that you can find. This particular fish finder is a great choice for anyone that wants to look at several different displays on the screen at one time while also seeing the important information you need. This screen is one of the larger, affordable options you will find at four inches but it is a great choice because, with that much screen space, you can ensure plenty of space to see several displays at one time. The Lowrance Elite-4 uses hybrid dual imaging to help deliver some of the best and clearest results compared to others on the market. The broadband sounder on this finder works to a maximum depth of 1,000 feet in the water and has an 83/200KHz element, just like the product that was reviewed above. In addition to the features mentioned already, you are also going to enjoy and HDI transducer as well as a built-in GPS antenna so you can easily navigate your way around the water. With the GPS antenna, you’ll get a detailed U.S. map included so you can see exactly where you are heading. The Lowrance Hook-4 is a great choice if you want to find a screen that gives you the most out of the display and packs in a ton of different ways to make sure that you can see what you want to see. 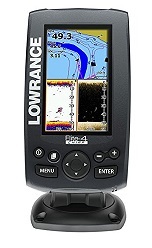 The screen on this fish finder is a high resolution, a four-inch color display that provides you with plenty of imaging. CHIRP sonar plus down scan imaging is the leading fish finder technology in the market today so that you get the best technology at your fingertips with this product. which means you can spend more time focusing on catching the fish rather than adjusting your technology. Lastly, you can track back to look at some of the record sonar waves and then use that information to pinpoint the location. This is the best fish﻿﻿﻿ ﻿﻿﻿finder under $300 in the market. As the saying goes, if you want the best, then you are going to have to pay for the best. While this product is by far one of the most expensive products that we have reviewed so far, it is also one of the best and packs in so many great features to help make your life on the water even easier. Similar to some of the other products, it has an improved interface that was designed with the user in mind to help get you some of the best features that you can find. Also, it uses built-in CHIRP and Structure Scan Sonar to give you high-quality images of everything that lies beneath your boat when you are out on the water. In order to try and replicate what you see underneath the water where the fish live and to better improve how you interact with the screen, Lowrance has made a better screen that gives you clearer definition of the sonar returns, dynamic dimensions and a strong, layered color screen that provides striking on-screen detail that you won’t find on any other fish finder in this post. One of the last things to mention as well is just how easy this product is going to be to use. While you need to install it onto your boat and mount it, you’re going to find that it is incredibly easy to do and you will be able to hit the water in no time with your new finder attached. The overall interface of this particular fish finder is what sets it apart from all of the other ones we have reviewed so far. The interface has been improved upon multiple times over the year, and this is a great product to purchase. The improved interface allows for you to use both the touch screen or the keypad option so that you can easily pick the option that is going to suit you best. It also has built-in CHIRP and Structure Scan Sonar to help give you the most accurate pictures of what is happening below the water. Additionally, you’ll find that the unit comes with a built-in, internal GPS antenna so you can easily figure out where you are going at all times you are on the water. To make it even easier for you, you can use the Insight USA charts for both coastal and inland US waters, which means you will never have to worry about getting turned around in an area you are unfamiliar with. Last but not least, you will have the option of two different transducers included an 83 KHz and a 200 KHz. The first fish finder we are reviewing here today is a great choice for the majority of people who might be looking to find a fish finder that can deliver them all of the necessary information they need on the water. The display on this finder is a four-inch grayscale LCD screen, and the unit as a whole operates at 300 watts and 83/200KHz. With this fish finder, you’re going to enjoy a built-in GPS that can help you navigate your way around the water in case you find yourself fishing in an area that you might not be familiar with. Additionally, you’re going to get a chartplotter with a base map that will allow you to navigate and plot just about anywhere you plan on going with this fish finder. You’re going to get a transom mount transducer that operates at 83/200 kHz. As the LCD screen was mentioned before, you’re going to like this screen because with it providing a grayscale display screen, you’re going to get the best viewing ability in any of the boating conditions that you might face. The ultra-accurate internal GPS antenna helps to ensure that you will never have to question the accuracy of the GPS reading and you’re also going to enjoy a one-year parts and labor warranty included with your purchase. If you are looking to find Lowrance fish finder reviews, then you have already made the first step to finding the best one to meet all of your needs. The products recommended above are all from the Lowrance company, and they are some of the best products that you are going to find. If you want a fish finder, I strongly recommend purchasing one of the products that were reviewed above. You will not be disappointed, and you’ll get a great product that you’ll love to use at all times. Great blog you have got here. It’s difficult to find high quality writing like yours nowadays. I seriously appreciate individuals like you! Is there any place I can watch a video of real fisherman using these products and demonstrating the practice use of the features? The Canadian Lowrance site has a link to videos but takes you to a product page without any videos. Yeah, You can search on Youtube.